A lot has happened since my last post. 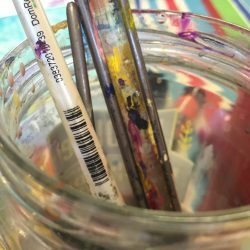 I can’t believe it’s been so long, but I’ve been so busy creating, that I haven’t had time to write about it! Between September and now, I’ve participated in one art festival, two solo exhibits, and three group exhibits. I began serving as the President of our local arts Guild in January. And over the past four months I’ve also designed and produced four very large public murals. So, now, it’s time to catch my breath and show you what I’ve been up to. Starting in October, I began to come up with designs for four murals that would be in the library at Frisco High School. I met with the librarian and principal at FHS, and we discussed how they would like the murals to be very colorful, livening up the library walls and appealing to the students there. They wanted something that reflected how the library was used, and were looking for a more modern, less traditional feel for the murals. Other than that, I was on my own! This is the first of the four murals, which measures 24′ x 8′, and is located behind the long circulation desk. 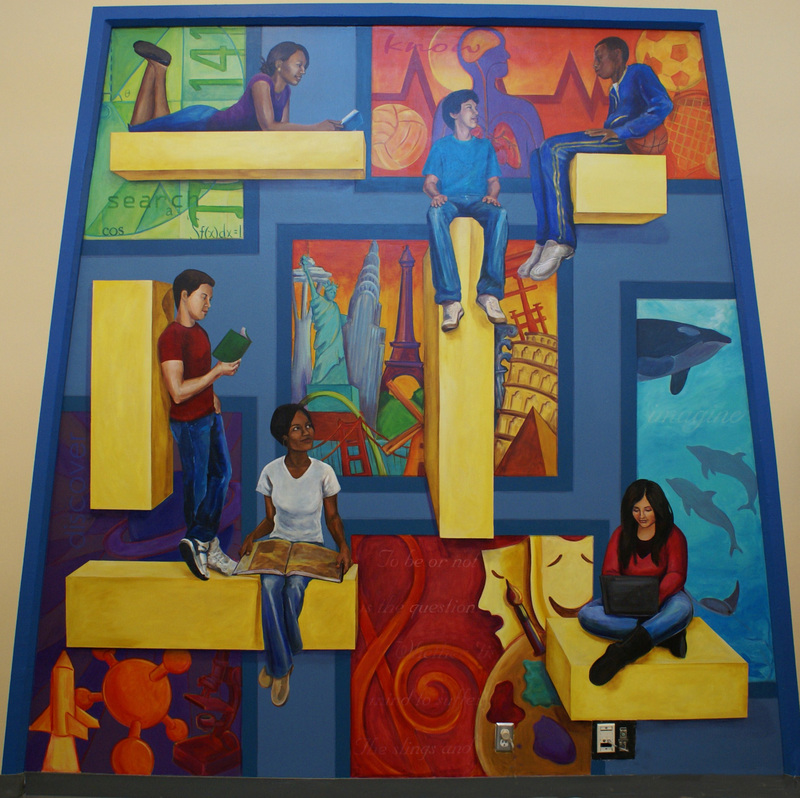 I call this mural “Connected,” because it shows the students connecting with books, technology and each other in the library. I thought it would be fun to play with scale in the composition, so I made the books and notebook very large. I tried to incorporate a variety of types of students, and I even used four FHS students as models for this mural. By the time I finished, I had several requests from other students who wanted to be painted, too! After completing my first mural, I moved on to the mural in the entry way of the library. I knew it would be one of the first things you would see when entering, so I wanted to create another image that really grabbed your attention. The third mural was at the very end of the long, narrow library. It is over the “College & Career” section, and it is called, “Outlook on the Future.” I decided to go with a simpler, more graphic design, but still wanted to play with scale and three-dimensionality. The background of this design includes a college building, a (long and) winding road, fields of blue, and a city in the back ground. The sky is full of gears, one with a compass, pointing the way to go. A lone figure stands atop a stack of books, looking at the future. In the foreground is a large book, that seems to be balanced atop the bookcase, with a graduation cap on top of it. The tassel really fools the eye, looking like it pops right off the wall. It has been fun to see the students and staff come into the library and try to decide if that book is real or not. They often have to go up close to find out. 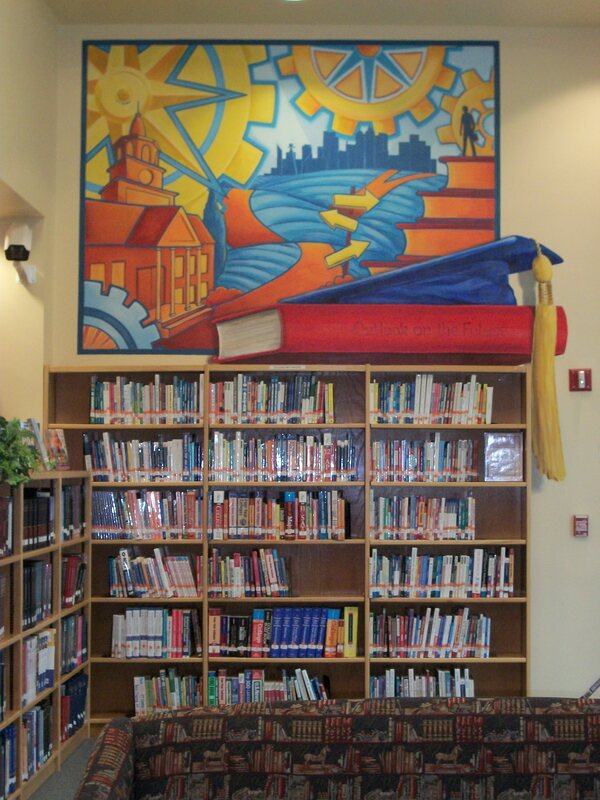 This is the final mural I painted for the library, in the fiction section. I wanted this one to be loose and fun, with a graphic, pop art look. I included references to 16 fiction books, two non-fiction books, and one really great bard. This is very close to the entry mural, and is visible from the second floor of the school, through glass windows. The library hosted a reception for me today, and it was great to hear the responses of all those who were seeing the murals for the first time. It’s always interesting to see how each mural appeals to people in a different way. Some prefer the realism of “Connection” and “Inquiring Minds,” while others are drawn to the more stylized designs of “Outlook on the Future” and “Imagine.” I love the fact that hundreds (thousands?) of people will get to enjoy them for many years. That’s very gratifying. This project has been a great experience for me, and I hope that it makes the library an even more appealing place for the students of FHS to hang out. I am so proud of you and for you! You are so creative with awesome ideas. I hope to see some of your art work soon. Keep on putting your ideas forward. Thanks, Aunt Bettye! 🙂 Creative genes.